Do you have rashes and spots on your eyelids? Reference to these pages has kindly been permitted by one of Britain's most eminent allergy experts, Dr Harry Morrow-Brown. If you have a rash on your eyebrows, Dr Morrow-Brown tells us this is characteristic of allergies from dust mites. 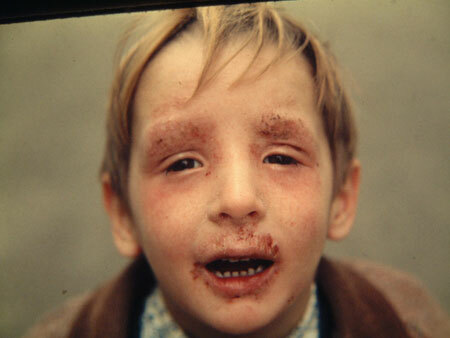 The eczema of the eyebrows is seen quite often when dust mites are involved in the cause. The rash round the mouth suggests that a food is involved, and the mouth is wide open because his nose is blocked by allergic rhinitis". "It is often very difficult to help eczema sufferers because there are often several causes. This means that unless they are all eliminated simultaneously the eczema will not improve. Avoiding single foods such as milk will only help if milk is the only cause, and to exclude one major food in turn risks missing the other foods, and several foods together may have additive effects. Inhalants such as dust mites and pets are often involved as well as foods, but without skin tests, which many dermatologists will not do, the importance of the environment is seldom recognised. If the eczema is allowed to persist for years repeated infections of eczematous skin may result in the formation of specific IgE antibodies to bacteria, thus making recovery even more difficult because bacteria are normally found on skin. Scratching causes loss of sleep, infection is common even when the nails are kept short, cracks on the hands are very painful and limit exertion and games, victims are teased and bullied at school and regarded as outcasts because they look infectious and dirty. Eczematous children put up with a great deal, and sometimes suffer all their lives. Thus there are many good reasons to investigate eczematous children for avoidable causes in the food and in the environment at as early an age as possible, rather than just put up with it somehow and wait for it to get better, and likely to change to asthma and rhinitis. View Dr Morrow-Brown's website on www.allergiesexplained.co.uk/drmb/eczema.htm and be sure to scroll down to see the extraordinary pictures.